Whether you are enjoying a smoked pulled pork sandwich or some baby back ribs, this Honey Whiskey Barbecue Sauce is tangy, smokey and finger-licking good! When my husband and I married 16-some-odd years ago, a good friend of ours bought us our first propane barbecue grill. We were newlyweds in our new home and loved having family and friends over for some good grilled eats. That grill was lovingly used all year long, since it’s always barbecue season here in Southern California. Needless to say, around year 7 we noticed the grill’s age. The bottom of the grill started falling off in chunks, then a burner stopped working. You noticed things like super hot spots and uber cold spots just inches away from each other, too. Yet, despite our war-torn-looking grill, we managed to squeeze even more life out of that grill and continued grilling with it for 8 more years. But before we turned our backs on ‘old faithful,’ my husband was continuously researching his future dream grill. First, we considered having a custom-made backyard kitchen, but that fell through. Then my hubs was going to build his own, but that required time that he didn’t have to give. We knew that smoked meats were a must in our future, so we said good-bye to the ease of gas-powered grillin’ and decided to go back charcoal. And just in time for the holidays, we bought our Big Steel Keg. Because everyone grills their Christmas dinner, right? I deferred all of the grillin’ research to my husband, because I cook inside the house and he’s in charge of the outside cooking. Hubby wanted the Big Steel Keg, so hubby got his Big Steel Keg. By the way, this is not a sponsored post. Just an honest review. Within days of our baby’s arrival, hubs was researching YouTube videos and he made smoked salmon (twice), baby-back ribs (three times), chicken (twice) and a pork roast (twice). 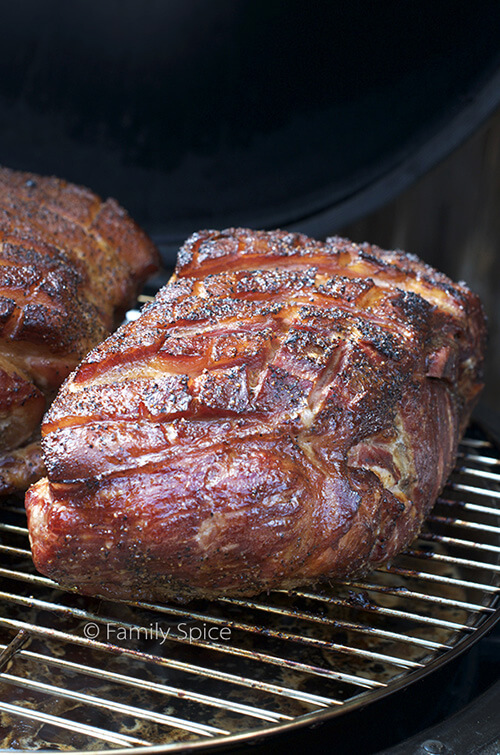 There is some finesse involved with smoking meats and grilling with charcoal – especially when you are used to gas grills. And then there was some lack of trust from my husband in regards to cooking time. The first time hubby smoked a pork roast, for example, he believed it would take 6 hours too cook while I thought it would need at least 8. So Hubs put the meat on the grill around 2pm. By 6 that evening I found myself scrambling to get a quick meal on the table, because the roast was nowhere near ready. In fact, I ate dinner, hung out with the kids, tucked the kids in bed and I went off to sleep and the roast was still not ready. Hubby didn’t come to bed until 3am. He later told me how ridiculously delicious the roast was and how he was pissed that he couldn’t eat more of it at 2am. Not to mention that the smell was driving our pup crazy. What went wrong? Hubs ran out of coal and had to heat some more up, but not until after he noticed that the grill temperature had dropped. It takes forever, especially in the middle of a January night – even for Southern California, for the temperature to rise up again. A do-over was quickly rescheduled. We made the pork roast again for a family barbecue Easter Sunday. This time hubby was up early and had the roast on the hot grill by 5am. For a big Pork Shoulder Roast, 10 pounder, it took about 12-hours to cook, plus an hour of rest. We followed this basic recipe and technique by the BBQ Pit Boys, a real man-friendly site, I might add. Check it out. Needless to say, this roast was Ah-Mazing! It was ridiculously amazing and just like the barbecue pork I devoured as a kid in those meat joints in Texas. Jaw-Dropping amazing. Trust me. I don’t think I will stuff a pork roast in a crockpot ever again. 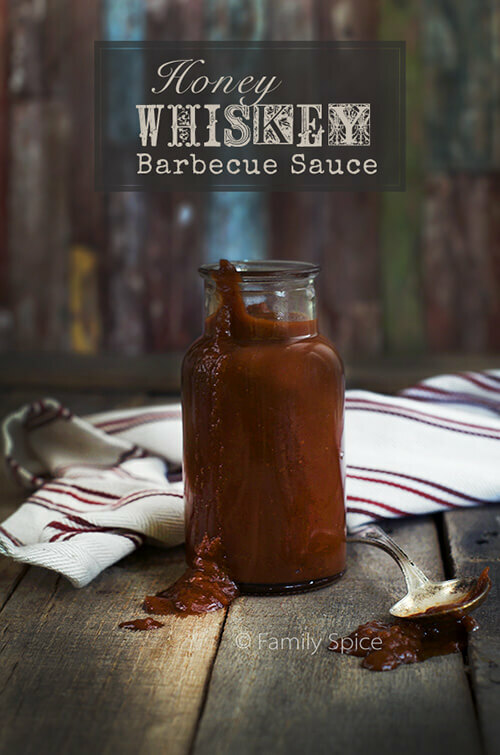 I did make some homemade Honey Whiskey Barbecue Sauce, for my little touch. I find most barbecue sauces to be unnecessarily sweet, so my sauce is much tangier. Feel free to add more whiskey, if you want a stronger booze flavor. Me, not so much. I’m a lightweight. The sauce went quickly. And quite frankly, so did the roast. We are so going to do this again. I’ll definitely be featuring more grilled recipes this year, especially since the hubby is helping out with the experimenting. Allow to simmer for 20 minutes then serve warm or chill for later use. 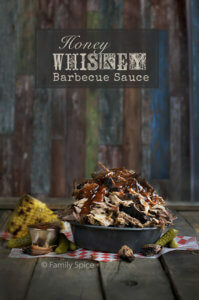 Serving Suggestions: Serve on chicken, ribs, pulled pork or anything you want! And bring on the leftover pulled pork recipes! Now, as far as the Big Steel Keg is concerned, we give it two BIG thumbs up. It gets super hot and retains that heat extremely well. As one Amazon reviewer said, “The grill can get up to 700-800 [degrees] in a matter of 20 minutes.” It’s also super easy to use. We really are thrilled with the new addition to our cooking family! Yeah, when you get into smoking time really becomes a factor! Easy to screw that up, but one always learns. 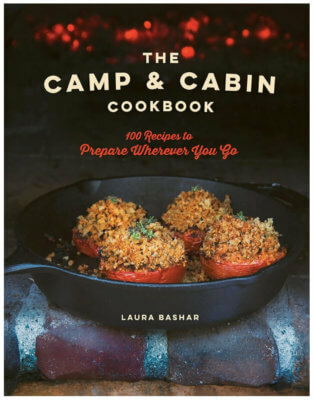 This looks excellent — my kind of food. And thanks for the link to the BBQ Pit Boys — that’s new to me. Hubby might want to check out the Virtual Weber forum, if he hasn’t already — lotta good smokers gather there and talk Q. Or at least they used to — I haven’t check that site out for a couple of years. Anyway, really fun post — thanks. I have an electric smoker and can’t deny I love the ease but now you do have me hankering to fire it up. Making my own sauce is a passion, especially boozy ones and yours sounds fabulous.